On October 10, the Internet showed up at the door of Phillips auction house. Over 600 people packed the Park Avenue room to capacity, likely the biggest crowd the contemporary art-focused company has ever drawn, and the youngest, in the aging world of high-end art sales. The guests had arrived for a history-making event: Paddles On!, the world’s first major commercial auction of work by digital artists. &apos;So many of these artists are representing themselves,&apos; Howard says. Both an exhibition and a buying opportunity, Paddles On! was presented by Phillips and the artist-friendly social network Tumblr alongside Paddle8, an online art auction house, which hosted a mirror of the event on its website. “We want to bridge the art and tech communities, and what better way to do that than to bring people together over art?” says Annie Werner, Tumblr’s Arts Evangelist. Paddles On! gathered a group of 18 artists who work with digital tools and on the Internet, including Rafael Rozendaal, who makes animated single-serving websites, Alexandra Gorczynski, a digital painter and installation artist, Nicolas Sassoon, an acclaimed GIF-maker, and Casey Reas, who works with generative abstraction driven by algorithms. It was curated by Lindsay Howard, the esteemed curatorial director of the Brooklyn new media gallery 319 Scholes. Howard worked with established galleries like bitforms and American Medium, but in many cases, the curator had to go straight to the source: “So many of these artists are representing themselves,” Howard says. That Howard and her artists drew a crowd wasn’t surprising, but the final results of the auction may have come as a shock to those who still believe digital art doesn’t have a place in the wider art market. The 17 lots that went to the block sold for a grand total of $90,600. For so long, the seemingly insurmountable barrier to selling digital art was the perception that no collector would willingly buy a GIF or a JPEG, or purchase a website simply for the idea of owning it. It now appears that there was just a lack of easy-to-access supply of digital work to buy. 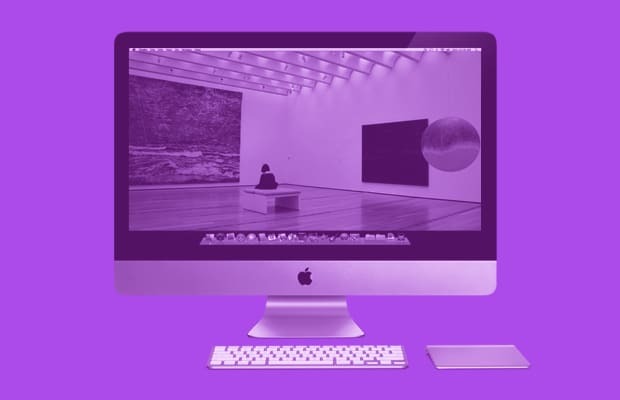 For so long, the seemingly insurmountable barrier to selling digital art was the perception that no collector would willingly buy a GIF or a JPEG, or purchase a website simply for the idea of owning it. Gorczynski’s work was one of the higher-priced lots, beating the better-known Rafael Rozendaal’s ifnoyes.com ($3,500), but it wasn’t the highest by a long shot. Americans! a software-driven animation by Casey Reas, sold for $11,000. Jamie Ziegelbaum’s luminous Pixel wall sculpture went for $15,000. The star of the show was Addie Wagenknecht’s Asymmetric Love Number 2, an angular chandelier made of security cameras, went for $16,000. These numbers are a far cry from the auction records reached by more traditional media like painting and sculpture. Over one night in October 2013, Christie’s sold nearly $700 million worth of art, including a $142.4 million Francis Bacon triptych. But unlike modernist painting, digital art is an untested market—many of the artists in Paddles On! don’t even have gallery representation, let alone auction records. Phillips is a smaller auction house than Christie’s or Sotheby’s and thus more willing to test the waters of the new digital art market. By doing so, they also have a chance to dominate the relatively open field, where major sales are still a rarity. At Paddles On!, “Everyone did really well, because otherwise [artists’ work] wouldn’t have been sold at all,” Nichole says. “After every lot everyone clapped, even for the $800 pieces, which never happens,” Lindsay Howard recalled. “There was the feeling that every time the gavel went down, that artist was going into the history books somewhere.” Paddles On! was a test of the nascent market for artists working with new technologies. The numbers suggest that Howard and her collaborators have come upon a new way to turn a profit for artists whose presences are online rather than in museums or galleries. New York arts non-profits like Rhizome and Eyebeam, which give out grants, curate exhibitions, and commission new work, supported technology-based art in the days that increasingly seem like its infancy. Those same artists are now being integrated into the larger art market and finding other sources of support that may actually fit their chosen medium better than slower, more academic institutions that rely on grants themselves (a portion of the proceeds from the Phillips auction went to Rhizome). Technology entrepreneurs, a prime audience for buying digital art, have different requirements than the art patrons of the past—namely, something they can tweet about. “Tumblr is like the geocities of art,” Jereme Mongeon, the managing director of Transfer gallery, says. Originally, Tumblr put out an open call for submissions to the exhibition and auction. “I don’t think it was taken very seriously,” Nichole added. Transfer benefited from the auction, netting a portion of Gorczynski’s sale price, but Nichole and Mongeon aren’t sure of the digital art auction’s lasting significance. &apos;I think we will see digital art becoming a part of mainstream art,&apos; Rozendaal argues. But in the meantime, art driven by technology has become a kind of badge of cool for those associated with it. For dealers, digital art auctions could lead to inflated prices and expectations for artists whose work they are still figuring out how to market and sell. “If they come in under estimate it can be really bad for them," Mongeon says. Yet the Phillips auction was a game-changer that signals potential business for the digital art market as a whole. The gallery does mostly low price-point sales, with most pieces going for around $1,000, but “it’s getting up to $10,000 for an average sale in 2014,” Nichole says. By taking a sales-driven approach to running a digital art gallery, Transfer is carving out a niche for itself that’s independent both of corporate brands and slow-moving institutions. “I think we will see digital art becoming a part of mainstream art,” Rozendaal argues. But in the meantime, art driven by technology has become a kind of badge of cool for those associated with it. In the non-profit space, museums are latching onto technologically-inclined art as a way to stay relevant and access a body of funding not previously available: the deep pockets of technology kingpins. As the Paddles On! auction created the right environment for tech entrepreneurs to personally invest in digital art, both the New Museum and the Los Angeles County Museum of Art are opening technology-art incubators (a term popularized by Silicon Valley) that are backed by board members and companies like NVIDIA and Google. The New Museum space will provide a home for artists and businesses alike, though the museum has not clearly stated whether it, like other incubators, will be taking ownership in the projects based there. There remains the possibility of conflicts when art and commerce come so close together in an institutional context. Museums are venture capitalists of a sort, investing in artists at an early stage and benefiting in collection value or reputation as the artists grow. But turning that into a literal commercial relationship is much more problematic. That the New Museum hired tech-art impresario Julia Kaganskiy, who is familiar with treading the line between the corporate and art worlds through her work at Vice, as director of the incubator, is a step in the right direction. She has a ground-level view of the changes that are happening in the digital art landscape and the difficulties facing young artists working in the field.